Taking the original Ben Sherman logo, House of Holland have created this unique all over print knitted crew neck jumper. 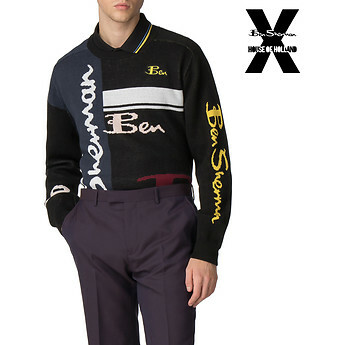 This AW19 Ben Sherman has collaborated with acclaimed British designer, Henry Holland. Holland is renowned for his daring, quirky designs with a nod to British subcultures, and was, therefore, the perfect person to team up with for the brand. Holland has infused his signature creative flair into a selection of classic Ben Sherman silhouettes to create a dynamic range that proudly represents the best of London’s street-style, combining a modern sartorialist twist with a rebellious spirit.